Featuring speakers from F5, Illumio, Nutanix, Rubrik, and Workspot. 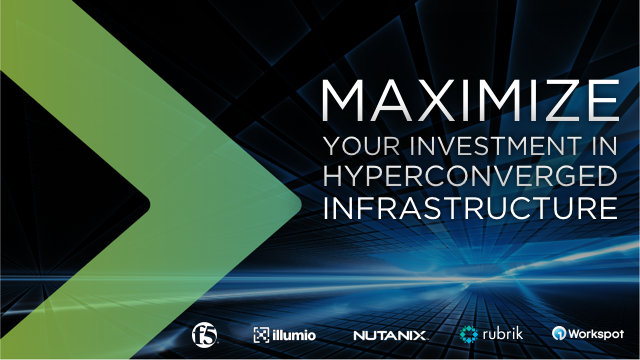 Compare and evaluate 4 leading hyperconverged platform-optimized solutions that expand the capabilities of the Nutanix enterprise cloud platform: F5 application delivery, Illumio adaptive security, Rubrik data protection, and Workspot VDI. • Workspot's cloud-native, infinitely and instantly scalable orchestration architecture (aka VDI 2.0) enables enterprise-class VDI deployment in hours, in which you can use all your existing infrastructure (apps, desktops and data). • Rubrik eliminates backup pain with automation, instant recovery, unlimited replication, and data archival at infinite scale -- with zero complexity. • Visualization 2.0 from Illumio shows you a live, interactive map of all of your application traffic across your data centers and clouds, and identifies applications for secure migration to the Nutanix platform. • F5 delivers your mission critical applications on an enterprise cloud that uniquely delivers the agility, pay-as-you-grow consumption, and operational simplicity of the public cloud without sacrificing the predictability, security, and control of on-premises infrastructure.